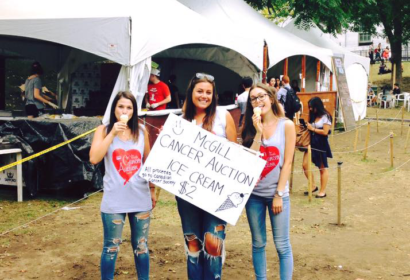 The McGill Cancer Auction is an annual event organized by the McGill Management Undergraduate Society to raise funds for the Canadian Cancer Society. Since its creation in 1967, the auction has raised hundreds of thousands of dollars to support cancer research and improve the quality of life of those suffering from the disease, including a record-breaking $45,000 in 2015 alone. Throughout the year, the Cancer Auction committee works to secure donations and items to auction from Montreal-area businesses. Past sponsors include WestJet, Tiffany & Co., ViaRail, the Montreal Canadiens, The Westin and Hyatt Hotels. For more information, see the Cancer Auction website.